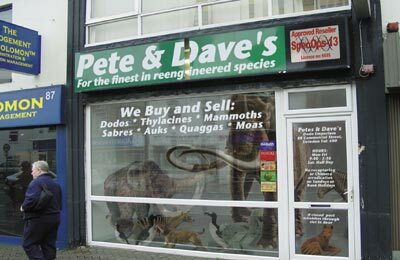 Full colour postcard of Pete & Dave's dodo emporium, situated at 88, Commercial Road, Swindon. Seen in the window are a mammoth, a mastadon, two Thylacines, two dodos, three great auks, a pygmy sabre-tooth and on the right, a quagga. Note 'Judgement of Solomon' high street franchised wisdom and decision-making shop. (Pre-empts threads in TN3 and TN4) Given out with the TN2 US hardback launch, April 2003.